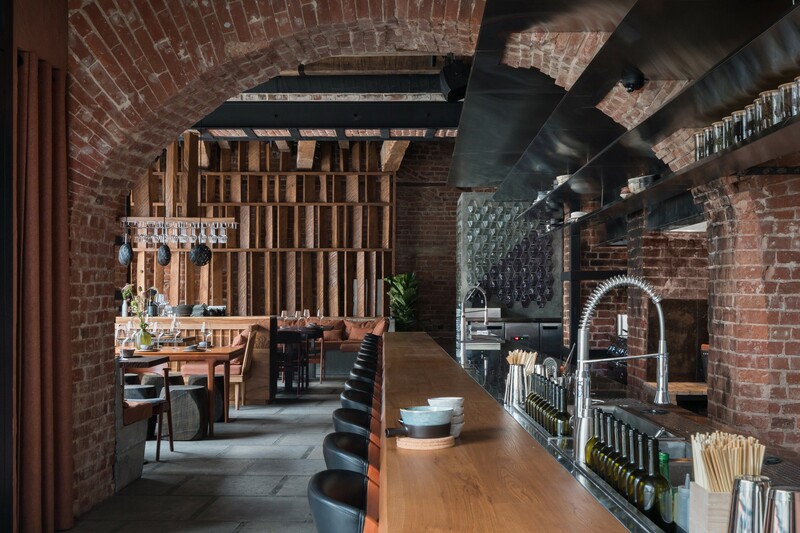 To create a cozy and minimalist interior for Pan-Asian gastronomy with a casual bar like “Izakaya”. Traditionally “Izakaya” is a Japanese pub and casual place for sake drinking. The small area of the gastropub had to fit 58 seats, with 19 of them at the bar. The owners also wanted to use Falconnier glass bricks, which had to be worked into the modern concept. 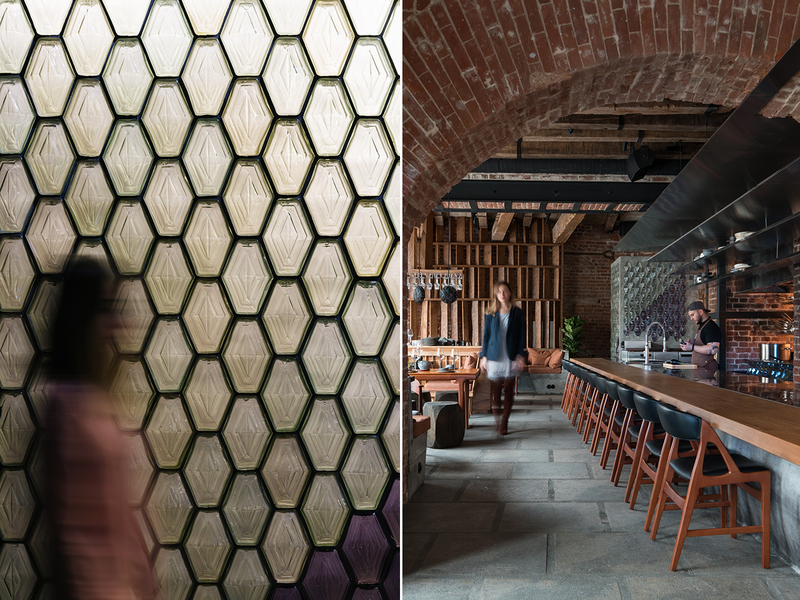 Inspired by the Japanese “Izakaya” style, we created the interior, minimalist in its colors, decorations, and materials, and sophisticated in delicately thought-out designer solutions, interesting to explore and decode. 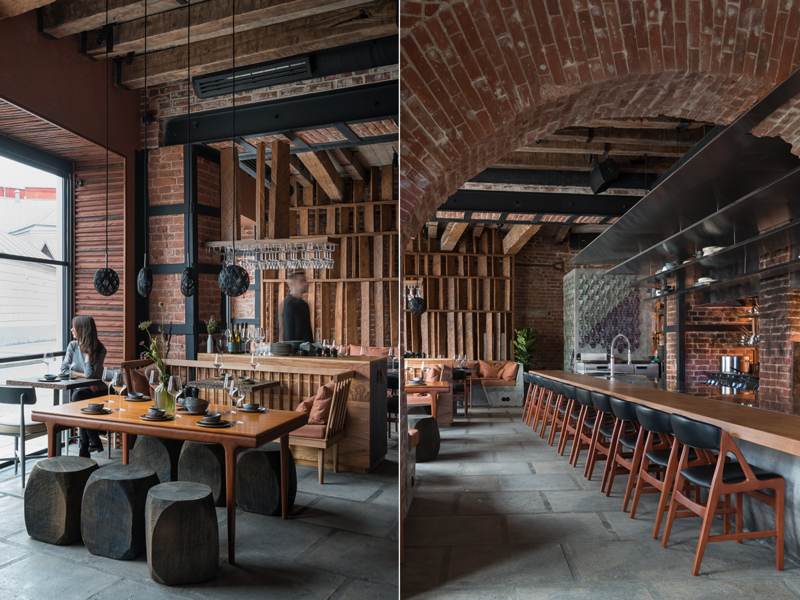 We used the legacy of the old space and accentuate the cozy seating and wood texture, as well as ascetic and natural materials. The large panoramic windows face the street. We gave the main spot in the interior to the long, low bar counter. We lowered the floor level in the kitchen zone so that the bartenders are at a level comfortable for the patrons and the guests are seated comfortably. The close seating is right next to the kitchen at a table where food is cooked, and it creates a cozy atmosphere in the bar. Another functional and interesting solution is three seats on the bartender side. That way the bartenders and the bar patrons can converse more. 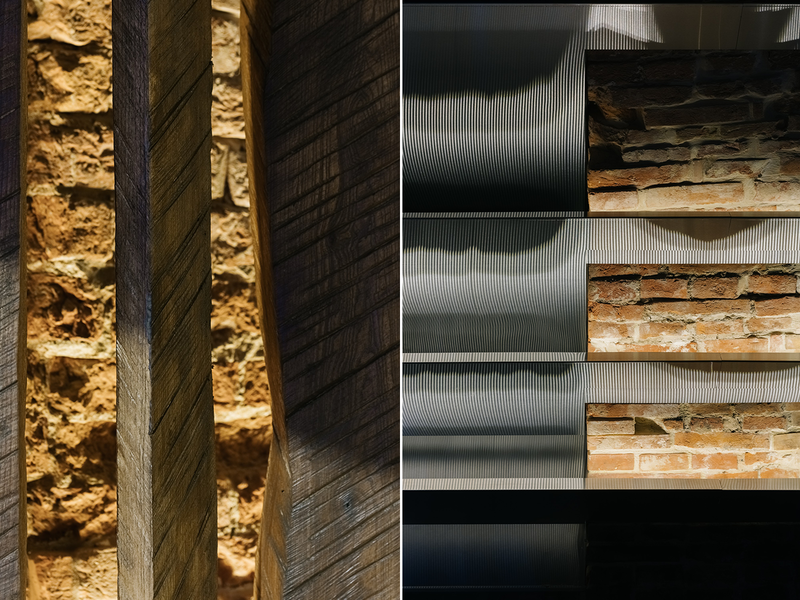 Solid wood, grey concrete, brick, terracotta textured plaster in the kitchen area, and glass – we use a limited number of colors in this interior to achieve a minimalist background. We kept the old beams with nails, and renovated the bricks and the breathtaking arch that we simply fell in love with. We supplemented it with natural concrete that was poured right there on location. 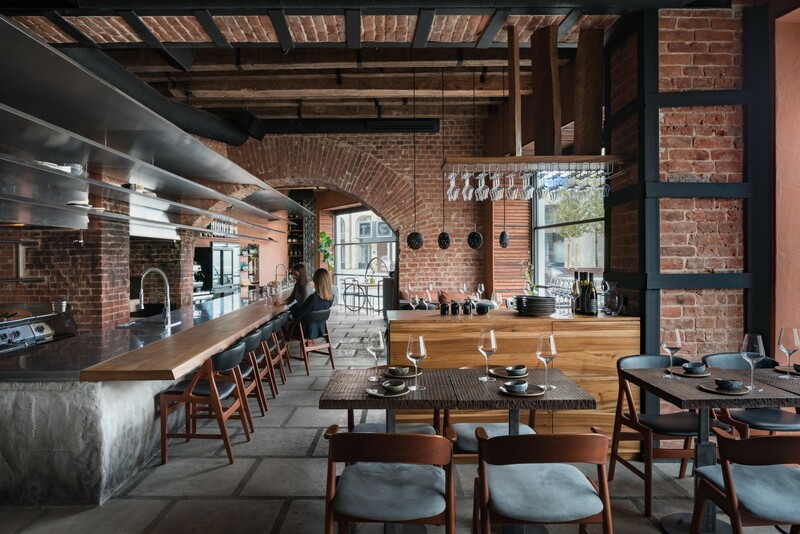 The flooring is natural limestone, and its vivid texture and uneven color makes it look like the continuation of the street’s antique pavement stones that were smoothly transformed into the interior. The warm hues of the materials allow the interior to maintain all of its coziness. An open fire, which was one of the client’s requests, reflects the Pan-Asian mood of the menu. 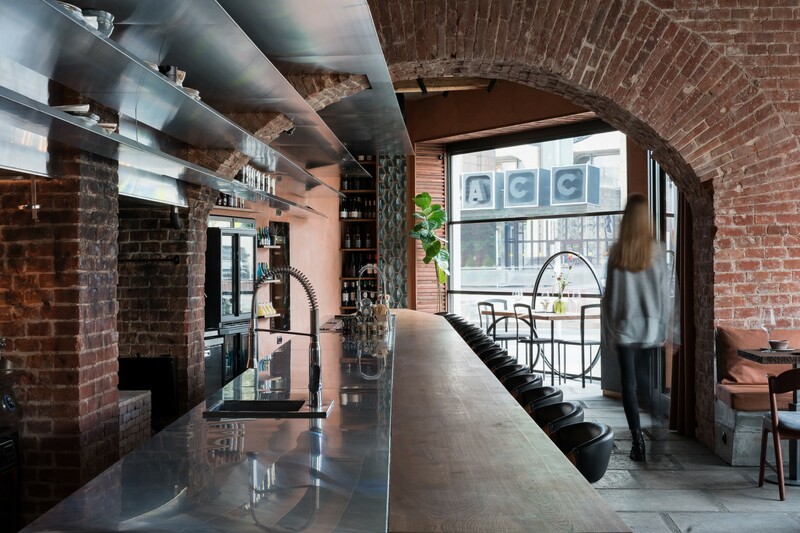 And we have “roasted” some of the elements of the interior – the lower part of the bar counter, the bricks, the decorative partition wall, and the sink were darkened. The shelves above the bar hint at Japanese minimalism and form an association with a pagoda. In order to emphasize the unusual seating arrangement: vintage chairs with a history: a set of six 1960s Kai Kristiansen teak dinner chairs with curved backs and elegant frames, along with four early-1990s metal minimalist chairs from Italy. We intentionally matted the aforementioned Falconnier glass bricks and used them to build the walls for the restrooms. The inside lighting hints at the pre-party atmosphere of the bar. This is how we turned the client’s requests into a glowing and somewhat mischievous art object.